There is no limit to where your intellect, strength, and spirit can take you. 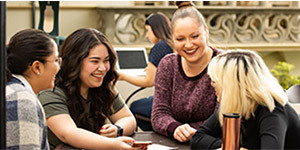 As the only Catholic women’s university in the western United States, Mount Saint Mary’s University provides a values-based education to propel you toward the life you have imagined. Our students are encouraged to explore their ideas and define their ideals as leaders in the community. Students can choose from more than 30 majors, plus internships, study abroad, research with faculty, and other experiential learning opportunities that complement classroom studies. A Mount education means students are required to both understand their major in depth and develop a broad understanding of how it affects society. Through a specially designed curriculum, students become engaged participants in their instruction. Infused with internships, research opportunities, and experiential learning, students apply their knowledge and gain real-world skills. The mission of the University is to develop leaders and critical thinkers equipped with the necessary tools to succeed in an ever-changing and multifaceted world. Further, we strongly believe a college education should allow students the opportunity to follow their hearts while leading with their minds. Mount Saint Mary’s is unique in that it offers two beautiful campuses to explore and consider. 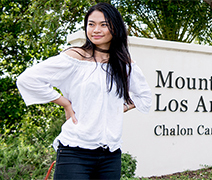 The Chalon Campus, perched in the Brentwood Hills overlooking Santa Monica, is home to our traditional undergraduate programs. 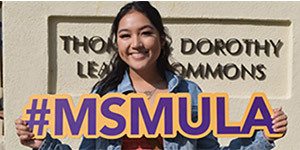 Situated on peaceful, wooded grounds just south of downtown Los Angeles in the historic West Adams district, our Doheny Campus houses the traditional undergraduate, graduate, and educational credential programs. Both our hillside and downtown havens immerse students in small, safe communities that are in close proximity to a major business district, entertainment venues, beaches, mountains, and much more. Few institutions can expose students to the types of experiences offered by the vibrant and diverse learning lab of Los Angeles. The Mount Saint Mary’s advantage is about providing students with an abundance of opportunities, including available classes and great academics at a price that is affordable to the average family. This extra advantage, however, should not come at a price that self-selects its audience. Our generous financial aid packages combined with merit scholarships make us a competitive option for families that are shopping for the “right” school. Our goal is to provide students with all the advantages of a small private institution but at a cost that is realistic in today’s changing economy.